Last month I mentioned that Kiyokazu Fujimoto from CLAMP’s management company Pyrotechnist would give a lecture at the Finnish anime convention Desucon. The event took place in the last weekend, hiro_bnk-san went to his lecture and has kindly wrote a report about it, which can be found here. 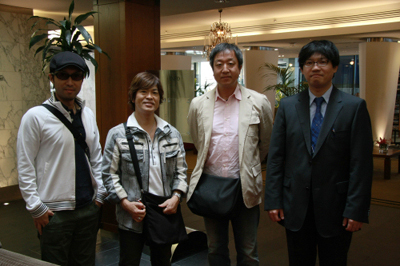 Kiyokazu Fujimoto is the third from the left. On his right is seiyuu Tooru Furuya, who also attended the event. A few more pictures can be found in the event’s blog. – CLAMP works whenever they feel like it. They have even drawn on an airplane giving originals back and forth over the benches. – CLAMP has meetings with a Pyrotechnist member once a week. The contents of the meetings are merchandising and advertisement, never about the content of CLAMP’s works. – Nanase Ohkawa doesn’t like traveling abroad. – Tsubasa and XXXHOLiC will end before the end of the year. Update: I was told by hiro_bnk that the Desucon staff recorded the lecture but unfortunately Fujimoto did not want the video put online. thanks a lot chibiyuuto-san, its a wonderful information. yeah, now all i need to know is about kobato anime, who will be the seiyuus? or what i want to know too is about X and Lawful Drug… they must finish X and Lawful Drug!! ! don’t you think? Actually Fujimoto-sensei is on Tooru’s right, the one on the left is Tooru’s manager Ikeda. I laughed at the airplane thing too x3 It’s exciting to know that TRC and Holic will end soon, I wonder what’s going to happen? Have you been following TRC and XXXHOLiC lately? Ah, no I haven’t, I have been up to other things and am so far behind everything seems really weird… -_- But I’d like to find out how things will end once they do. Wait a minute, that’s what I said O.o The one in Tooru’s right is the one from the far left, which is Fujimoto, right? Who is Fujimoto? The one wearing sunglasses? Sorry, I meant that he is right from Tooru! xO The one with sunglasses is Ikeda, the one between Tooru and Yasuda-san from the embassy is Fujimoto. I’m sorry I was unspecific. Wish I had the chance to travel on the same airplane as them. XDDD But that’s no big surprise: most artists draw even in cars to kill time. Really? I didn’t know that! I think I will stop stressing out and sit back comfortably. I don’t think it will go that far but for one, I don’t think volume 28 will be the last, things are moving too slowly…and if Clamp start exposing FWR back story and we got a flashback of his reasons behind wanting to resurrect Yuuko or his relationship with her, it could take a while…at least, I don’t think TRC will ends before we learn a minimum about FWR objectives and wish. I don’t think we’ll have FWR’s “backstory”. I mean, not like we had of Kurogane and Fye. I think yes, of course, we’ll learn more about him, but I don’t think in the form of full-lenght flashbacks. is the one along the dubbers who will dubbing Kobato TV?! He will dub Kobato,really? I have never heard of Kobato’s seiyuu being announced (?) Or am I missing something? Ohkawa sensei doesn't like travel abroad? quite surprising to me~ Then fans who have the chance to meet her abroad must treasure their chance. I though Mr. Fujimoto’s remark that “unlike other artists whose style changes during the work, CLAMP always controls the style of a particular work so that it stays the same during the whole thing” was ironic, considering how much the art style of X and Tsubasa have changed. I agree with that. And X was running for 10+ years, it’s natural that it changes during its course. But I guess he meant that CCS always looked like CCS even though they were drawing CLOVER, X and Wish at the same time (CCS was just an example xD). I’d like to add that one person asked about what CLAMP thinks about fan-made scanlations online and he said that they appreciate its value to the non-Japanese speaking fans but are sad about the fact that the image quality is so low. They’d rather like their work being published the way they mean it to be seen, in good quality. Oh really? Thanks for that! And that answer is a lot more friendly than I expected! Glad to see that they don’t DESPISE it and they acknowledge that its true value is to make it accessible to those who do not have access to such material. I was really happy to hear it too. ^__^ That’s why I thought it’d be a nice thing to tell everyone in the fandom. He sounded a bit hesitating about it but overall the reply was positive. Ohh, that’s good to know. |Db Thanks! Hi, i always visit this livejournal, it’s very interesting and rich of informations! !Thank you, chibiyuuto! !Could i ask you something? Don’t you think that only one volume left for xxxholic it’s too poor for explaining all the things that have been left in suspance? I fear that all is going to be too fast now in the plot, as it has been for the story of yuuko san, and it’s a pity because in this way they will ruin a story that until now has been so interesting!! ;_; I’m so sorry for that! !